Marquis Spas has launched a new Aquatic Training Vessel for its retailers to target the flourishing swim spa market with the help of six-time Ironman World Champion Dave Scott. The patent-pending Aquatic Training Vessel (ATV) has been incorporated with bonded polymer resins, which are utilised in the marine industry’s most expensive and rugged boat and yacht hulls, to create an ultra-strong swim spa with innovative bowed sidelines. These have been created for a more stylised appearance to help the ATV stand out from the typical swim spa box of water. 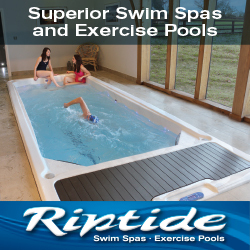 This design provides a more spacious swim area and workout space than conventional rectangular swim spas. To ensure greater structural integrity, the ATV’s external frame is a uni-body gusset construction to provide enhanced rigidity to further support the vessel’s bonded polymer resin strength. The covalently bonded macromolecular structure ensures the ATV is impervious to the crazing and cracking found in typical acrylic swim spas. 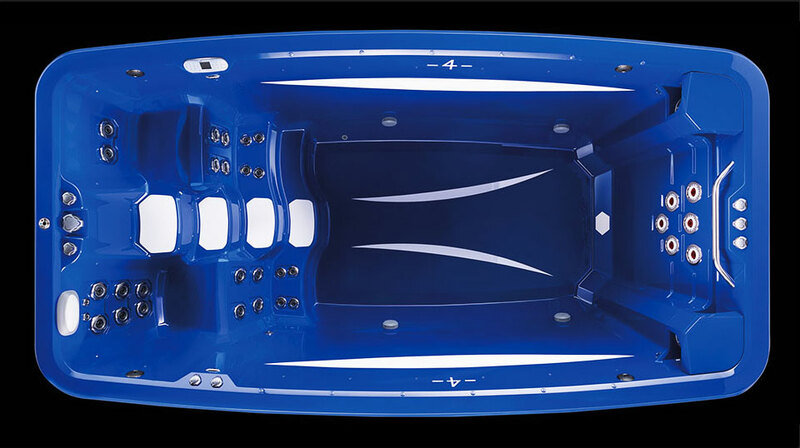 Also, as part of the design process, Marquis Spas has manufactured the flagship ATV 14, which comes in at 168.5” x 89.5” x 56”, with six high volume turbo jets, 480 GMP/1817 LPM Flow Rate, and a true four foot (122 cm) water depth. This allows for a more extensive full-torso range of exercises when immersed in the water. Water capacity is 1,725 gallons, while the dry weight is 971kg and full weight is 7,496kg. The three pairs of turbo-jets of 80 GMP (gallons per minute), deliver a customisable water flow to optimise swimming, while a standard 50 amp electrical service design powers the three independent 160 GMP, two-speed pumps to provide a complete spectrum of water flow options. According to Marquis Spas the pumps can generate miles per hour flows that exceed competitive swimmer gold-medal performances. An open, level floor area is lightly textured for more stable footing during aerobic workouts, while a swim tether or optional Resistance & Rowing Kit provide extra resistance for superior swimming and exercise. 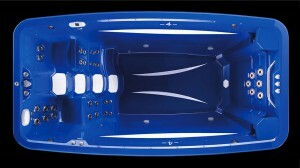 Famed Marquis Spas hydrotherapy jets and flow controls have also been incorporated in seat locations for leg and torso massage. In conjunction with the manufacturer’s high flow/low pressure massage action, a therapeutic deep seat and a post workout cool-down seat are also incorporated into the design. The interior steps have been created to ANSI/APSP/ICC-6 safety stairs specifications for safe and secure footing while users enter and exit the ATV. Along with the stairs, the vessel floor has a smooth, yet tactile surface treatment to allow users to gain optimal water aerobics footing and non-slip navigation when walking or exercising. To further enhance ownership, there is LED lighting along the steps for enhanced visibility. Owners can also choose sub-waterline LED lighting, as well as the fountains’ 12-point water feature option to create arcing streams of water along the ATV’s walls. As part of the launch campaign to help its Dealer Direct retailers to promote the new ATV, Marquis Spas has team up with Dave Scott, the First Inductee to the Ironman Hall of Fame, to provide online exercise guidance with a dedicated SwimSpa Training section on its website.